Apparently the weekend was brought to us by the letter B, as those three things pretty much sum up our festive weekend. David worked late on Friday, and I was asleep by 9:00 pm, but we made up for it by packing Saturday and Sunday full of springy fun. 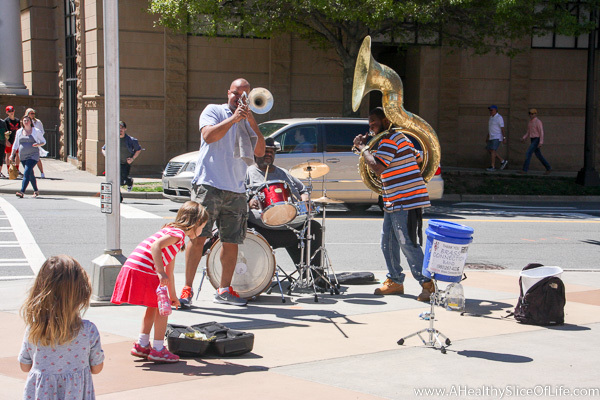 Saturday was our neighborhood spring festival and we lucked out with the most gorgeous day ever. The temperatures barely grazed 70 and the sunshine was in full effect, making for a comfortable time for all. 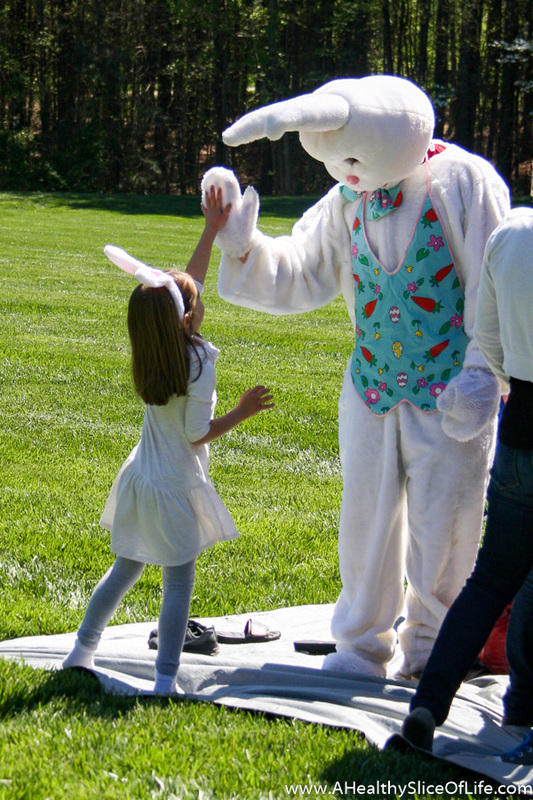 Even the Easter Bunny. 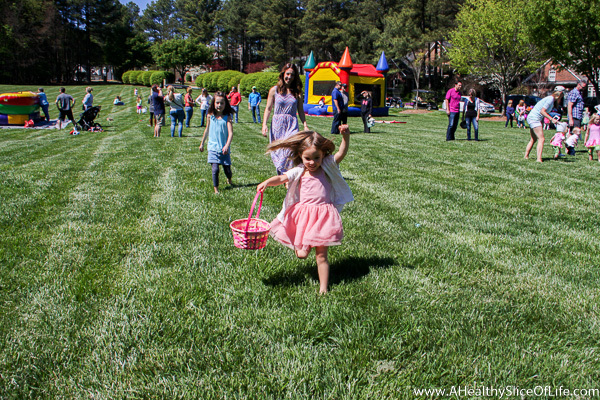 There were separate egg hunts for all the age groups. Kaitlyn cleaned up, rightfully so in the 0-2 range (we’re hanging on to that 2 with all we got, right?). Hailey ran incredibly fast with determination, but let’s just say I’m glad we’ve been practicing hiding and finding eggs around the house all week because I’m not sure if egg finding is an innate strength of hers. 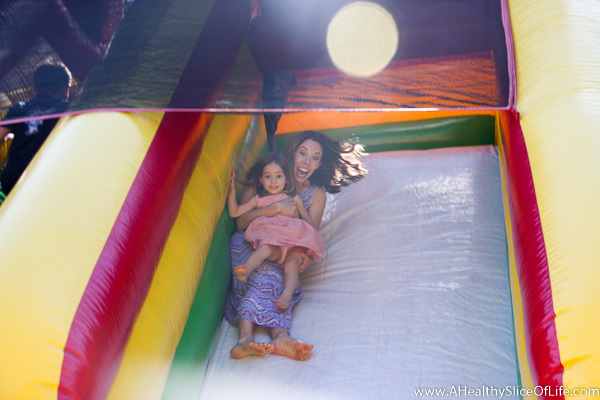 Regardless, a happy time was had by all, minus my elbow which now has bounce house burn. We made it home with enough time to all hang out on the back porch, David with his guitar, the girls interrupting his guitar playing, and me snapping pictures of it all with a glass of wine. 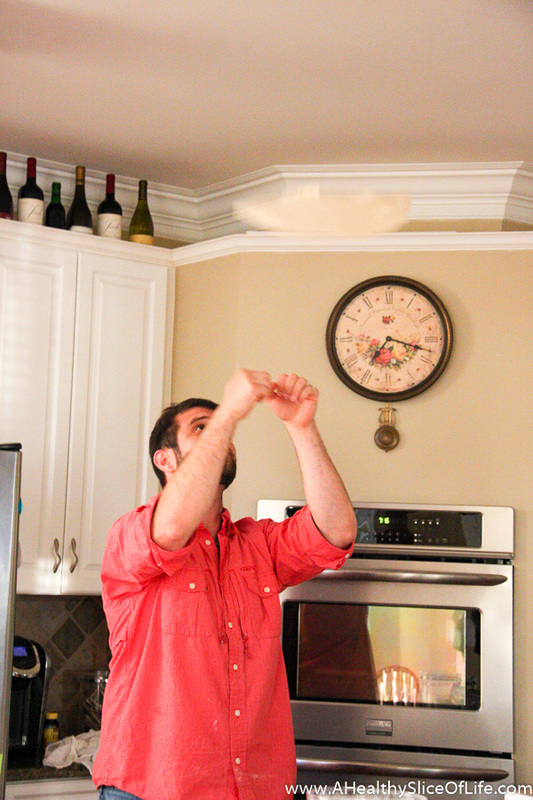 The girls ate pita pizzas, then after they went to bed, David got to work on rolling our dough. He doesn’t just look like he knows what he is doing, he actually does. It was our first grilled pizza(s) of the season and truly, if you’ve never grilled pizza dough, add it to your summer bucket list. 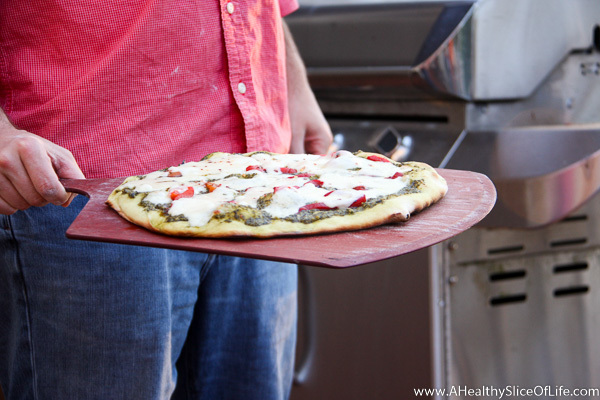 Soggy bottom pizzas make me squirm, and the grill ensures a nice crisp crust– perfection! Sunday morning Kaitlyn was yawning at the breakfast table, making me unsure about our grand plans for the day, but being that she’s the second child, we pushed on with them anyway. 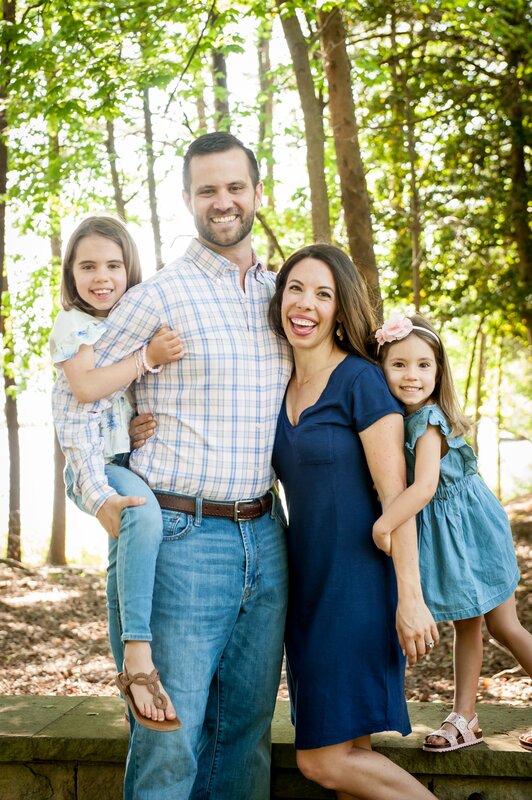 We all went to church, then changed clothes and headed into Charlotte. 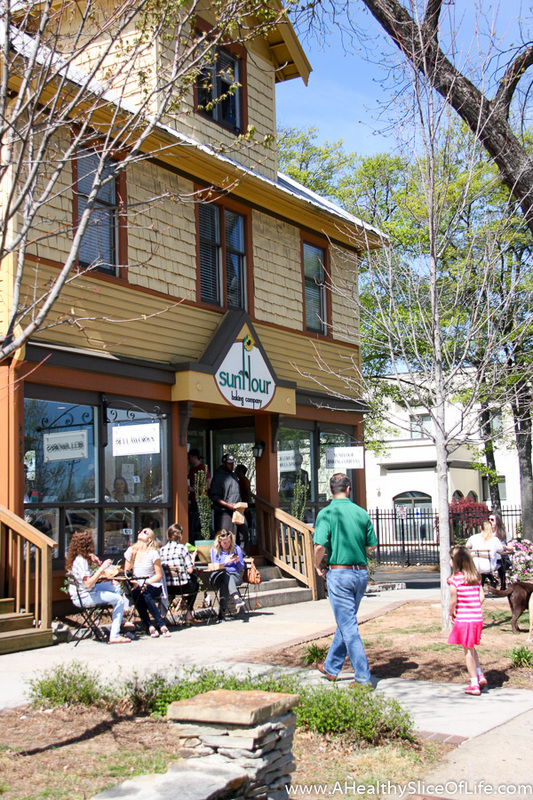 Our first stop was the Sunflour Bakery on East Blvd. I have only been to their Elizabeth location, but go figure, this one was full of the same incredible sandwiches (I had spicy hummus and roasted vegetables on sourdough) and fluffy, sweet muffins. From there we headed uptown where we scored $5 deck parking right beside the stadium. 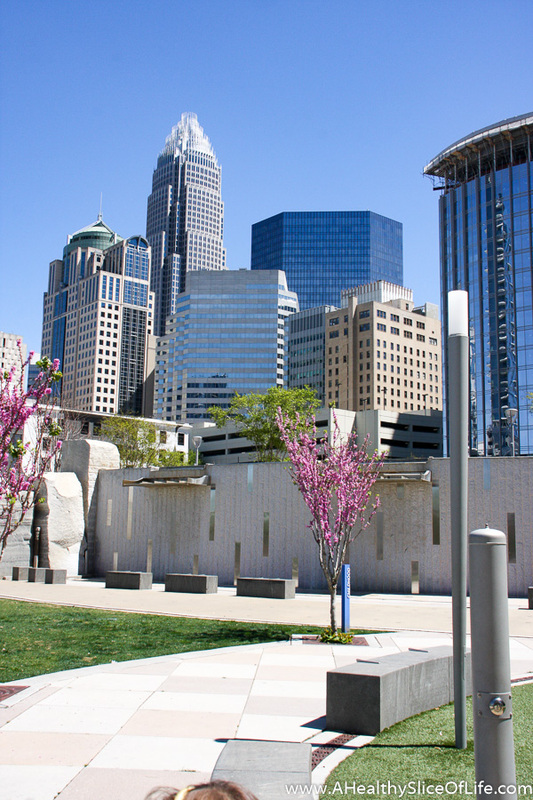 Since we were early and had never been to Romare Bearden park, directly across from the stadium as well, we decided to wander for a bit. The park is beautifully done and buzzed with the energy that only a city park can. We stumbled across a couple ladies having a picnic and when our kids started playing, they offered me a mimosa. How does one say no? So David and I spent the hour before the game chatting with these 3 friendly strangers and I left reaffirmed in my belief that most people are kind and good. Finally we moseyed our way to the stadium, enjoying the sights and sounds along the way. 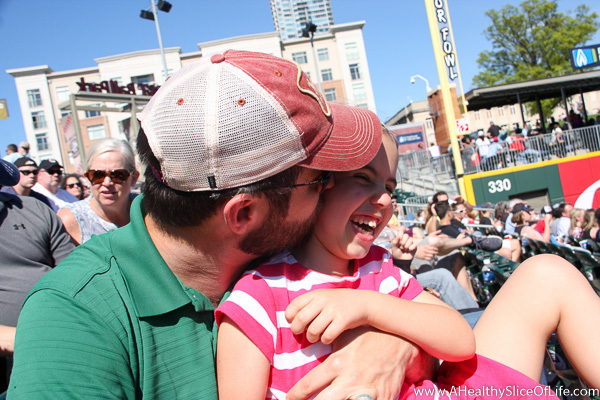 We found our seats with our friends we talked into coming with us and set up for a lovely afternoon of watching the Charlotte Knights play ball. 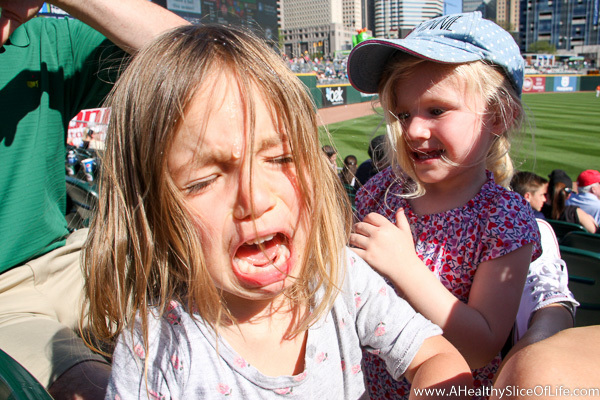 However, we realized with the first pitch that our girls know absolutely nothing about baseball. I honestly found myself saying, look girls, see this picture. That’s what a baseball looks like. That kind of info might have been overkill, but David did end up sitting with Hailey, explaining every action. 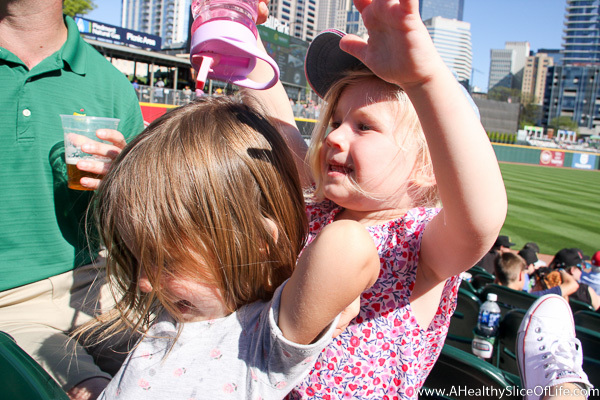 It was pretty warm in the stands and Kaitlyn and Louisa entertained each other by pouring water on their heads. Which was really fun, until, well, until it wasn’t. The most exciting part of the day came when a foul ball came flying right towards our section. I watched it happen in slow motion, yet incredibly fast. I ducked over Kaitlyn as the ball soared right over us, where my head was 2 seconds prior, and directly into my friends’ hand. The good news was Porter got the ball and hopefully ice and Advil will be enough to heal Katie’s hand, but it took me more than 5 minutes for my breathing to return to normal. Luckily Dippin’ Dots (the world’s saddest form of ice cream in my opinion) settled our nerves. I guess it’s baseball’s way of ensuring we pay attention. 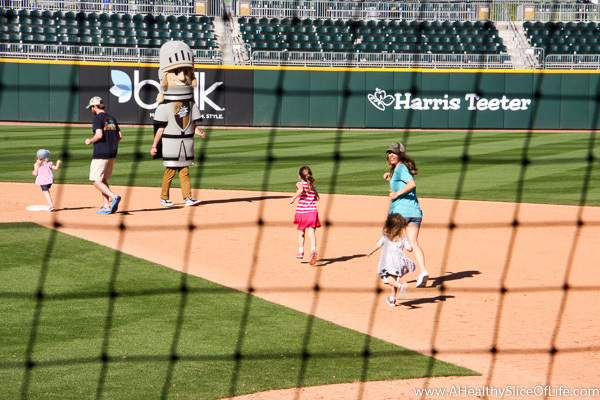 We stayed until the end when the kids got to run the bases. And by kids, I mean me, too. We made it home in time to inhale some take out sushi and shower up before all calling it day. All in all, a great weekend for the books. Would you consider yourself a country, suburbia, or city kind of person? I swear my preference changes depending on which location I am in when you ask me! We recently moved to St. Petersburg, Florida and it’s the perfect hybrid. A 10-minute walk downtown to the city BUT our neighborhood feels very suburban, with kids riding bikes and parents watching from their porches. Oh yes, the best of both worlds!! I do love having a yard to play in, but having more of a city buzz nearby is certainly enticing at times. Looks like you guys had an awesome weekend! Haha, I like the specificity 😉 I love the idea of a big ol farm too, but not sure I’m really cut out to keep up with all the demands. Still, I’d love to have chickens one day! Looks like a fantastic weekend! So much fun! I’m definitely more of a country girl, though, occasionally I don’t mind visiting a larger city for the amenities they have to offer. We live in Suburbia right now, which is a good in between for me for now and with luck we can find something a tad more “country” that’s still close by. Thankfully it shouldn’t be too hard to do. Your photos are so clear lately, have you changed cameras or techniques? And three cheers for 9pm bedtime! What a fun weekend! Thank you!! I’ve been using our DSLR (Canon 40D) on the regular instead of my Sony Nex. I’ve really wanted to learn to take “real” pictures and am finally putting my effort where my mouth is… or something like that 😉 I still have so much to learn, but am having fun playing with it! Looks like it was a great weekend! 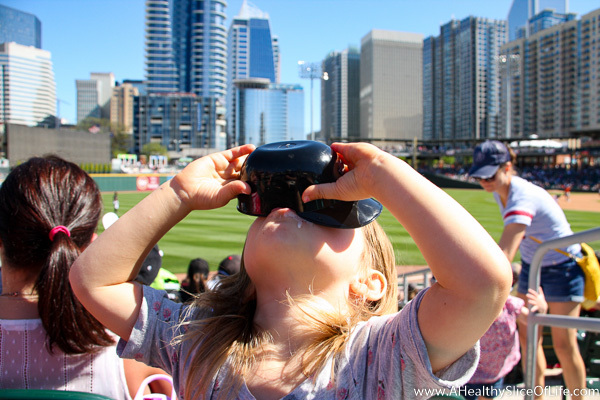 We took our daughter to a football game last year and she had NO idea what was going on, haha, but she definitely enjoyed the snacks! I like to daydream about living in the country, or in a big, exciting city (like NYC) but in reality, I think suburbia suits me just fine. 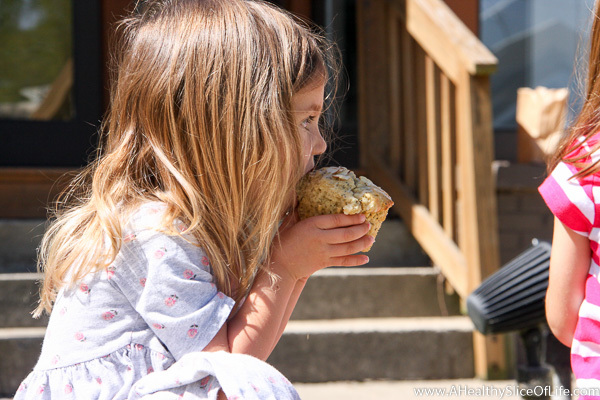 I really like to be able to walk to grocery stores or coffee shops with the kids (which I can do where we are) and I would definitely miss that in the country. And city life is appealing as well, but it means we would have to downsize a lot (we already live in a fairly small home and are running out of space!) and I could also live without city noise all night long. What a fun weekend! I have always lived in cities, but love the country and want to move to there someday. My ideal is probably somewhere rural but an hour or so from a decent sized city. My family has a ranch two hours away from us and we go there as much as possible, love to be outside! I like a mix of both! Our house is pretty suburban/rural but I need my city time! Okay your weekend looksseriously awesome!! 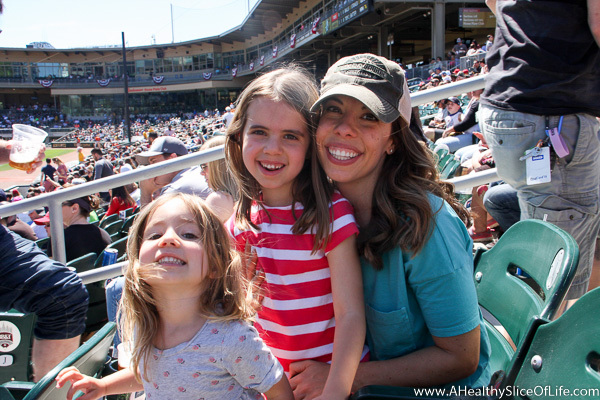 I love going to baseball games!